Have you read this series? If you haven't- you really should. 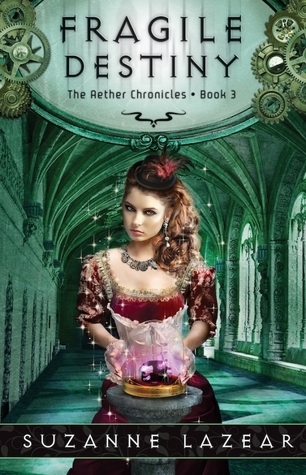 The Aether Chronicles has some of the best creativity and imagination that I have found in a series. It is literally a book that I would call "rollicking fun" (and I don't even speak like that!). Fragile Destiny is the third (and perhaps last?) book in The Aether Chronicles series. It is the perfect blend of steampunk and faeries. It seems like an odd combination, but somehow- it absolutely works. I love Noli. I love that she isn't completely sure of herself and doesn't always make the best decisions. I love that she has an honest and good heart and that she really cares for the people around her. I love that she picked the "good guy" instead of the "bad boy" and that she is completely devoted to him. Noli and V have a sweet romance (when he wasn't being a butthead in this book). I find it to be absolutely believable and fun to read. This book would be suitable for younger ya readers, but enjoyed by kids and adults alike. There is a bit of whimsy in this book- it doesn't try too hard to take itself seriously, but isn't a parody. It captures the magic of fantasy while remaining grounded with a solid storyline. The steampunk parks of the story enhance the plot without overpowering it (like many of the steampunk books I have read). This is not a read that will make you ponder the meaning of life, it won't make you question your beliefs and values, but it will give you a reason to escape into a wonderful adventure with lively characters and a gripping plot. Fans of fae books should read this series- they won't be disappointed. Sometimes it is actually VERY good to read a story and not need to ponder the meaning of life when all is said and done. This sounds like it would be a fun read. I'll have to check it out. Thanks so much for a great review.